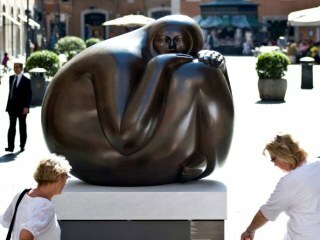 I'm interested in this Jiminez Sculptures in Rome by Jimenez. Please advise availability and price. Thank you. A study grant brought him to the Faculty of Architecture at Florence University, Italy, sparking his contact with the main artistic movements of the European continent. The years spent in Florence provided Deredia with intellectual stimulus, deeply changing his approach to his artistic work, and extended his interest in the Renaissance period. He developed a new perception of life, the being and the universe. The experimental phase which identified this period led the artist to create a series of sculptures characterized by interlocking elements, negative and positive forms and parts which detached from a main unit. It was also then that he started to reflect the extraordinary creative influence received by observing the monumental granite spheres, produced by the pre-Columbian, civilization of the Borucas in Costa Rica, which greatly impressed him as a young boy. To him they represented important proof of a civilization. These "childhood spheres" erected a bridge linking spirituality and rationality; they represented the glue for an ethnic group. "That time, inside the museum of San Jose, I realized that the only thing I could do in life was to sculpt, comparing myself day after day to those masterpieces of simplicity and greatness" says Deredia. Those artifacts of mysterious primordial strength moved the sculptor towards studies as much of shape and material used, as of function and symbolism derived from the sphere and circle. Between 1990 and 1993, he furthered his metaphoric re-interpretation of the elements of the pre-Columbian culture, devoting his attention to the composition of still life (nature morte), by carving works out of Carrara grey marble and creating bas-relief in red bricks and painted aluminum. However, vases, bottles and jars placed on top of a base or hung on a wall, in the case of the bas-relief, became sensual, they stretched and grew, moving closer to each other and bringing life to the composition that Pierre Restany defined as "Natura Viva" ("Living Nature"). Over these years, Deredia continued to develop a thought process which eventually became stable in the Genesi (Genesis) and in Immagini Cosmiche (Cosmic Images), laying the foundations for the creation of his personal theoretical-artistic 'system': "Transmutative Symbolism." These two works represent the climax of all elements and historical and artistic references which have characterized all previous work. However, the awareness and development of a thought process, of a philosophical approach for his work together with the extraordinary care in working the marble and the bronze, have enriched these sculptures with a renewed soundness. He participated in the 1988,1993 and 1999 Venice Biennale; this Venetian experience was marked by his meeting with the celebrated art theorist and critic Pierre Restany. The friendship and collaboration born at that time would prove to be crucial to Jiménez's artistic and intellectual growth. In 1999, he was the first non-European artist to present his work of a statue of Saint Marcellin Champagnat in St. Peter's Basilica. In 2006, after an important personal exhibition held in Florence, he received the nomination of Correspondent Academician of the Sculpture Class by the Florentine Academy of Art and Design. 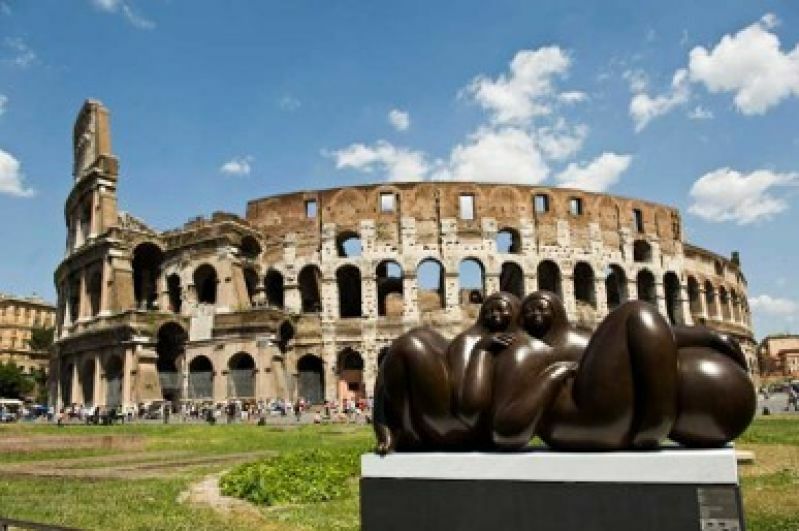 Notably, he was also the first contemporary artist to display his sculptures in Rome's two most famous archaeological sites: the Roman Forum and the Colosseum. Later, in 2009 he also devised a project entitled 'La Ruta de la Paz' (The Path of Peace), which involved nine monumental sculptural complexes, based on the cosmic principle of the sphere being placed across the Americas, stretching from Canada to Tierra del Fuego. This colossal project combined his signature archetypal form of the sphere with his theory of "Transmutative Symbolism." In forty years of work, Jiménez has created monumental pieces for museums, external environments and public institutions in eleven different countries in Europe, America and Asia. He has held 34 personal exhibitions and over 100 collective exhibitions. Artists have long contemplated the world as a cosmic mystery of grandiose proportions that could only be conceived through a visual language of symbols. In their search to understand these symbols, in order to elevate their own work conceptually and intellectually, they often strive to enter into an historical discourse about the role of signs in the artistic worldview. What are the most significant signs and symbols? Who created them? Why? When did simple notations become objects? How can a contemporary artist be so bold as to include his or her work in such ancient discussions? Jorge Jiménez Deredia has long known that truly informed works of art can only be created when understood within the visual symbolic context of the past. The beginning of seeing that occurred in pre-historic times addressed essential notions about nature and man's relationship with her powers. Deredia is inspired by a similar need to give visual meaning to these eternal mysteries. His sculpture explores the circle or sphere, arguably the most important and widespread geometric symbol, and its relationship to the human form. The form of the circle corresponds to that of the sun and the moon as they appear to us on earth. In the philosophy of the Platonists, the circle is the ultimate, perfect form. It represents eternity, an expression of perfection with no beginning or end, no direction. Heaven is a round dome; Zen Buddhism pronounces the circle as enlightenment with the perfection of humanity in unity with its primal principle; the Chinese symbols of Yin and Yang are enclosed within a circle to denote the harmony of the universe. Cultures throughout the world have adopted the circle as the most powerful and significant of symbols. Deredia describes his first encounter with the power of the sphere, a circle in three dimensions, at the age of nine in 1963 when he first saw a group of Pre-Columbian spheres at the San José National Museum in his homeland Costa Rica. They made an enormous impression on him and for years he searched for their meaning and their history. The spheres, of polished granite in various sizes that can be as large as 15 tons in weight, were once aligned on the ground in astronomical patterns. Made by the Borucan peoples of Costa Rica over seventeen hundred years ago, the spheres once numbered in the hundreds, perhaps more. They represent not only the life-force of these ancient peoples, as symbols of cosmic perfection, they are also ideal examples of abstract sculpture and the very nature of their spatial containment is still the inspiration for the very distinctive aesthetic that is described in the sculpture of Deredia. As he pays tribute to the ancient peoples and their extraordinary understanding of the sky and the astronomical paths that determined the life force of the earth, Deredia encompasses notions of eternity with the spiritual essence of human beings, especially the female, the Great Mother and Goddess of Fertility, revered throughout the world. However, this transmutation between physical and geometric forms that is the essence of his works manifests itself in sculpture that transcends a single identity. 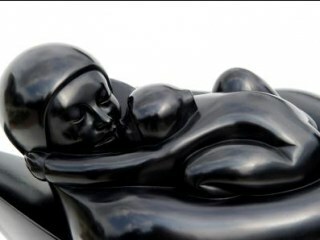 Figures entwine spheres and each other. There is an organic unity to each sculptural object, with its figuration as abstract as natural, and the analogous character of primitive and mythic imagery his innate expression of the significance of life. There is also happiness and a sense of humor in the sculpture of Deredia. 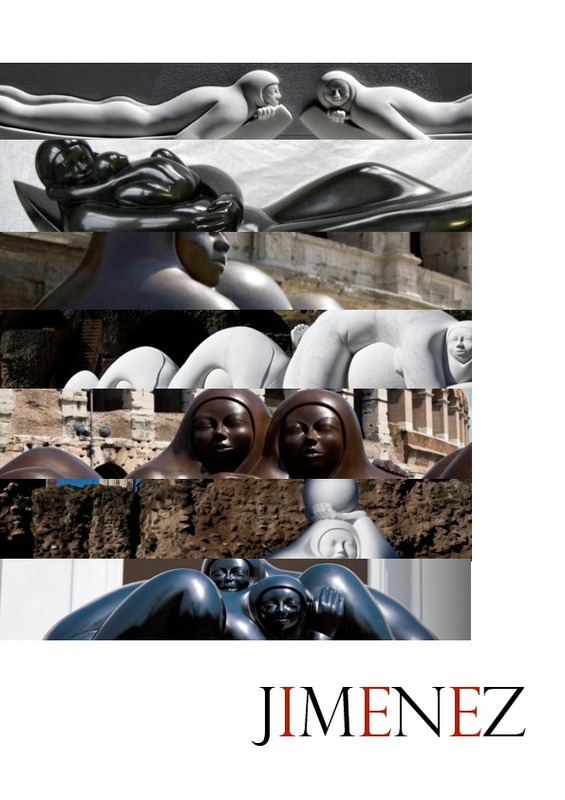 In his rotund human forms, defined as a series of rhythmical relations and undulating shapes, Deredia endows his archetypal fertility figures with ample masses and childlike smiles. Each face is as serene and peaceful in its countenance as the harmonious synthesis found in their enveloping forms. The spheres that have inspired their forms perform a playful routine and take on new life beyond their geometric origins. 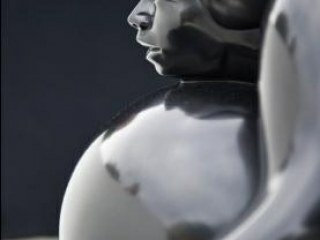 Figures also emerge from egg-like shapes in profound references to the essence of life. These ovoid sculptures that often morph in and out of their natural associations are especially beautiful when carved out of pure white marble. Deredia recognizes that choice of medium affects content and marble lends itself to the contemplation of the origins of life. His intimate knowledge and respect of materials enable him to not only translate his objects from stone to bronze and work in three dimensions, as well as in relief, but to achieve perfect harmony between form and content in all his works. Expanding beyond the spherical into other geometric shapes, such as triangles, the artist continues his span of reference from mathematical to the symbolic. Ever aware of the architectonic complement to nature's organic forms, he develops other compositional elements to further comment on the dynamics of life's interlationships. The simplicity and dignity of his shapes and this clear approach to material result in a personal aesthetic that is as informed intellectually as it is beautiful. For Jorge Jiménez Deredia, the art of sculpture is an act of harmony and balance inspired by the beginning of seeing and ancient reverence for nature. Argentina. Buenos Aires. ARTEBA, Feria de Arte de Buenos Aires. U.S.A. Miami. US Century Bank. Jorge Jiménez Deredia at Brickell Avenue. Romano - Palazzo Massimo, Museo Romano Altemps, Deredia a Roma. Italy. Pietrasanta. Sculture e Scultori. 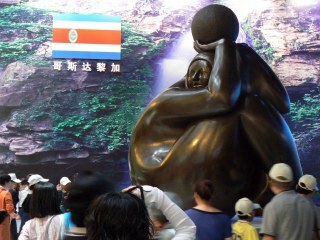 International Sculpture Exposition. U.S.A. Miami. Boca Raton Museum of Art. Italy. Lido of Venice. 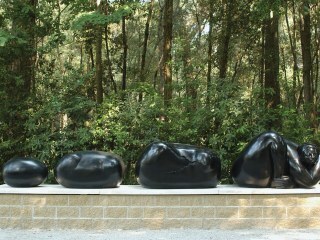 International Sculpture Exposition. Open '99.